There's also the hideout in Rattlesnake Hollow just west of Twin Rocks. Super useful, thanks! Looks like hitting these points might be a fun way (not necessarily the most lucrative, but fun) to start off the in the game, no? I have had a look but can't find anything listing what time of day the gangs appear at each location. Maybe we should start find this out ourselves and make our own map? These are very good for getting XP. You get 150 for clearing the camp plus whatever you get for each kill. It's 5xp per kill minimum but there's bonuses for head-shots, long distance, special ammo, on horseback and mele (any others?). I'm starting to keep track of what I get. First one was 380 XP. The Willard's Rest (far North East) one only appears at night for me. But it does not appear all the time. I have been near there fishing & hunting a while and it just did not appear. I kept moving away and coming back, as I don't think they will start if you are too close to begin with. So this might not be that simple. Does the game keep track of day-of-the week? If so maybe it's certain times of certain days? The Loft and Bacchus bridge I got in daylight, didn't note down morning or afternoon. A lot of the information on other websites is out of date. Many places say you only find the treasure map on the leader or in a chest / lockbox nearby. I think that was how it was done originally but now it seems there is just a random chance of getting a map off any of the enemies, but no guarantee any of them has one. I'm in! Will start noting the time when I encounter one. I like doing these as ways of farming ammo and practising my aim with the revolver (I'm poor, was too late for freebies!) and just hunt in-between hideout locations. Multitasking like that is quite fun and feels less grindy. I've watched some recent vids on the subject and people claim you get 1 map per 25/30 gang hideouts with 25% chance of there actually being a populated hideout on average. Some people claim that places near Valentine are active more frequently. The chance of it being populated might be instance-related and depends on when someone was there last time. Another guy said that it had something to do with having carcass/actively hunting... all of these are of course anecdotal! Sorry for double posting, but I couldn't figure out how to edit the post (is there a timer on it?). So, here's an interesting thread about hideouts and a route that a guy takes. Might try that myself soon. If you look closely there's another hideout north-east of manteca falls that he named manteca docks (in Austin area, south of Blackwater and Thieves landing). Also, he found a few extra gang ambushes (altogether, there's like 4 extra of these that are missing from the map above that I've counter thus far, he's missing a few south east of valentine that show up on other community maps, but maybe he just skips them on purpose). I have a supposition that gang spawn frequency is dependent on posse size and activity within the lobby. I think more data could be gathered if a full posse was formed and everyone dispersed to hunt solo, then 2x2s and a three, a three and a four, and finally as a full posse. The downside is that it will be time consuming, but i'm willing to grind it out if anyone else is keen. Thoughts? This is great. I've written times down ever since I read about that map. I assume hideouts activate on the hour so if I arrive at one at 17:40 I just write down 17. As you can see, I've been at a couple hideouts when they should be active but weren't. I don't think it has anything to do with day of the week or something like that but rather if another player has already been there, there could be some other cooldown timers in place as well, and in some situations it might just be bugged. I've passed several hideouts where the icon only shows briefly and there's no one at the camp. Sometimes it works if I ride away and return, sometimes it doesn't. Dj, you're the excel pro. Would it make it easier to get an overview if we had a spreadsheet where we could dump our times? Lastly, there's a hideout down at the Sea of Coronado that isn't on the updated map. 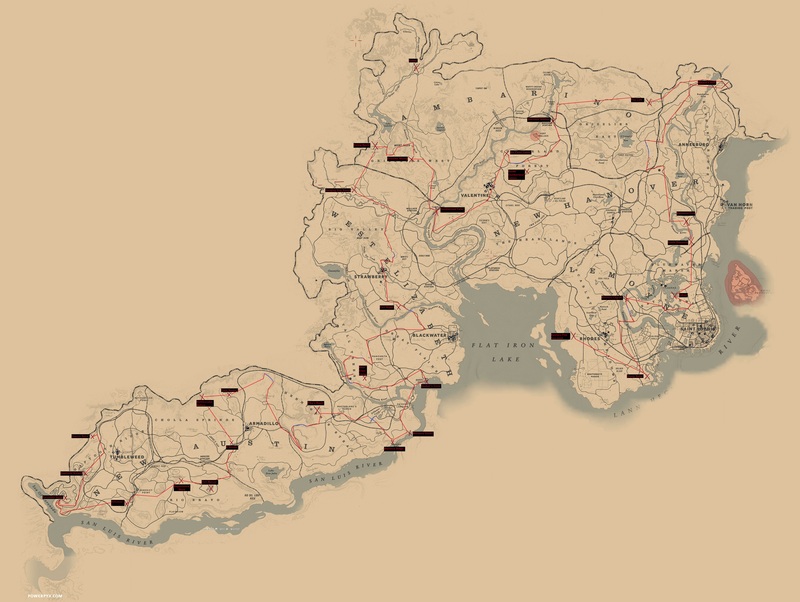 With that, there's a total of 30 hideouts so that's hopefully all of them. Here's my list, feel free to update with new encounters (I've already collected mine and the ones provided in this thread). If you arrive at a location at, say, 10:35 am, increase the value for that location by 1 in either 'active' or 'empty' column accordingly for the 10:00 am slot, etc. As mentioned elsewhere, you might not have a hideout active depending on other things, like when was the last time someone was in the area, but at least we might learn when some hideouts are never showing up, for example. I've seen a vid where a guy has got a map (his only one) from an ambush, so it would be good to do the same for these as well! Probably will do that next since they first need naming properly. I have a feeling that there might be more ambushes that people haven't found yet and aren't on the map above (I know of 4 for now). One thing I'm sure must effect these is stranger missions. Some of them will send you to places where gang hideouts occur, e.g. to deliver mail, kill / rescue NPCs, retrieve a wagon etc. It could be the game picks another location for the stranger mission if a gang hideout is due to become active there in the next few minutes, or it could be it uses the location for the mission and then the gang is not active there. I suspect it's the latter, that would seem to be simpler way to code the game to me, i.e. a stranger mission using a location turns off any gangs becoming active there until the mission is over. I did not know that ambushed could drop maps. That makes them a whole lot more interesting. That's a good point. I definitely think they would go for the latter solution as well. Hopefully we can gather a bunch of data to make our own map with time stamps and some solid info on spawning. Other than benefiting ourselves individually, it could also benefit the crew with some serious traffic to the site. Indeed! I was doubting that original vid that I've seen it happen in since it was edited, but here's another one in full here which makes me think it's legit! I better start looting when ambushed! I wonder if they work the same way as hideouts. I'm pretty sure now stranger missions overide gang hideouts and then stop the gang appearing for the rest of that day. I was near Willards rest which I think we can be fairly sure has the gang appear from 23:00 onwards. I was there before 23:00 & noticed another player approaching doing mail delivery and they went to the Willards rest farm house. I hung around for a while afterwards and the gang never appeared long after the other player had left. I've gone through @AlCohonez's spreadsheet and noted down what times we have seen gangs at each hideout between. I've assumed where we don't have data between two times close together that do have data that the gang would be there between those times. e.g. for Bachus Station we have seen gangs there at 01:00, 02:00, 06:00 and 08:00 so I am assuming gangs can be there any time from 01:00 to 08:00. There are still a lot of gaps to fill in, some of these hideouts have only been seen open for a couple of hours, but I'm sure they must be open longer than that, we just haven't observed that yet. I also suspect there may be the odd mistake in places as well. Some hideouts appear to be open for more than 12 hours, which I doubt is correct. But what is clear is that however the game works out when gangs are there it's not as simple as in GTA when there were 3 clear times of the day for gang attacks to occur and they did not overlap. These time zones (whatever we call them) do overlap. It seems to me there some open from 00:00 to 12:00 and others from 12:00 to 00:00, but then there's some definitely open from 06:00 to 18:00 as well. So my guess is they all have a 12 hour window to be open, split into 4 overlapping groups, 00:00 to 12:00, 06:00 to 18:00, 12:00 to 00:00 and 18:00 to 06:00. But I can't be sure of that yet. These are the time between which we have observed gangs spawning. Anyone else noticed a bug with these? This has been happening since yesterday for me. The red icon that marks the gang hideout on the map does not disappear (I'm sure it used to once you had actually started attacking the gang members), I never get the gang hideout cleared message and the XP for doing so, even though I'm sure all gang members have been killed (none visible on map, can't hear any shouting insults, no red areas marked on the edges of the minimap) and on one occasion the gang members were not showing at all on the minimap even when there were some left alive. Haven't played the last few days but have had that issue on several occasions in the past. Not often giving the amount of hideouts I've done. Is it every single hideout it does it? I only did 3 yesterday and it happened to all of them, Colter, Ewing basin and Cumberland Falls. That has never happened to me before. So I thought it might be a bug with all of them that had just started yesterday. But there were other problems yesterday as well; I have never known it to be so unreliable for starting stranger missions. I put that down to the bonuses on them, thought it was just too many people trying to do them. They could all be related I guess and I have sent R* a bug report and a feedback rant about this. Okay. Never happened to me twice in a row. Hopefully the whole thing was just extra unstable yesterday. I got that all the time before the last update, works fine for me now. I sent a ticket to R* support. Of course their initial response was to reset local user settings (hold L1 + R1 when starting up the game), which I did and it made no difference. I have now been asked to re-do one specific gang hideout where the bug occurs and save a video for them, which I will gladly do. But I've asked if they could advise me how to ensure a specific gang hideout is triggered or know if it will / won't be happening in that session. Last night, The gang hideouts were working fine for Ultra and I. They were actually spawning like crazy, but neither of us got a treasure map out of 7 or 8 of them. Interesting, it appears that you can get treasure maps from npc's in stranger missions too, not only from hideouts and ambushes. At least from the ones you get from Hernandez up in Colter, the game describes these as trappers and they have other loot too, like perfect pelts etc. I would recommend you try the area out, one of the most chilled places to hunt and do stranger missions in peace. Did it pop up that you got a treasure map or did you find it in your documents later? You can get treasure maps from a hideout or ambush and it not show up as you're looting. He basically loots a trapper in a stranger mission and gets a pop up immediately about a map. That guy lost or deleted his channel today. Running off this vid, I've got three Gang hideouts to spawn. When I'm wanting hideouts, I always have a 3 star big animal or 3 star big skin on the back of the horse. I first head to the Colter hideout. If it doesn't spawn I go to Flaco and run his mission. If it's a player assination, I move away and respawn. I run the mission and get another 3 star for the horse and hunt other animals. I go back to the Colter hideout. If I didn't get it going up, it WILL spawn after Flaco. I hunt more and head to Ewing Basin. If it doesn't spawn, go hunt in the next valley and go back to it. I then hunt my way to Hanging Dog Ranch. If it doesn't spawn, I hunt and gather herbs and then return. I usually hunt to Strawberry and sell. Easy $100+ at he butcher plus Flaco $ and .12 gold and maybe a treasure map.